National Parks encase some of the world’s most awe-inspiring, humbling and bewildering feats of nature. These incredible landscapes which predate us, and will outlive us too, allow people of different ideas and opinions to agree on the same thing: what we have before us here is beautiful. Not only this, national parks also demonstrate how vital conserving our planet really is. Our world just wouldn’t be the same without them. And here are 10 we think you really should visit. 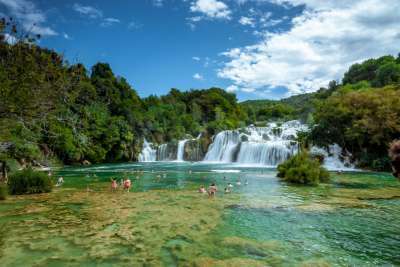 Standing statically along the running Krka River, the gorges of Krka are the only feature of this national park which do not flow. 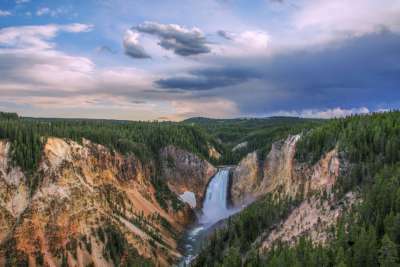 Instead, they provide a hump and a crater in which hundreds of waterfalls clamber together, as they tumble down into pools as green as emeralds. You can feel the spray and the foam on a boat trip, or as you paddle through the pools. You can get here fairly easily from Split Airport, and your best option is probably the bus. These run daily from the airport, and take around an hour and 40 minutes. 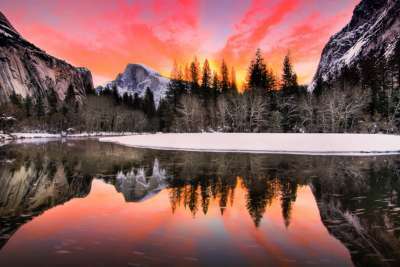 Providing the USA with one of its most formidable natural landscapes, Yosemite is a parade of drifting clouds, toppling waterfalls and gnarly granite faces. The craggy rocks and inimitable sunsets face pools of water so clear, that they're duplicated into a near-perfect reflection. Your best bet on getting here is to hire a car from Los Angeles Airport. The head-turningly beautiful road to the park usually takes around three hours. 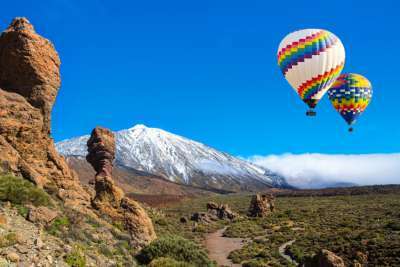 Teide National Park is the biggest park on the Canary Islands. It offers a unique eyeful of volcanic landscape with frozen rivers of petrified lava and gaping craters, all shadowed by the silhouette of the Teide volcano. The combination of rock formations has created a hodgepodge of colour; of brick-reds and muddy browns. The park lies in the north of the island and can be navigated to from Tenerife North Airport, with a drive time of less than an hour. The jungle-fringed national park of Arenal Volcano is a big window into one of the most biodiverse destinations on Earth. Costa Rica's suite of white-water rapids, swamps, toucans and beaches can all be found here. 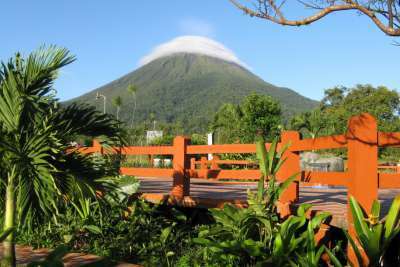 The main feature though, of course, is what juts out of all the foliage: Arenal volcano. This is Costa Rica's most active volcano, while its dormant neighbour, Cerro Chato naps away nearby. You can see them both after a two and a half hour drive from San Jose Airport. Though public buses are cheaper at around $5 dollars, although they also take around double the time. Around an hour-and-a-half from Cancun Airport, you'll find Tulum National Park. Buttressed by a 12-metre cliff which overlooks the Caribbean sea, you'll find a series of ancient ruins, built by the Mayans over 600 years ago. Although these stony relics remain the focal point, you'll find them framed by fan palms, as a legion of iguanas scale across the rocks. However, the alluring juxtaposition of the craggy rock and the deep-blue sea is what really makes this location special. Although there's no doubt that you would have seen this immense natural landscape on some kind of screen already, there's no comparison to actually breathing in its air and feeling it under your shoes. Here, layers of history are literally exposed. Bands of reddish-brownish rock, each alternating in colour, represent hundreds of thousands of years of history on an epic scale. 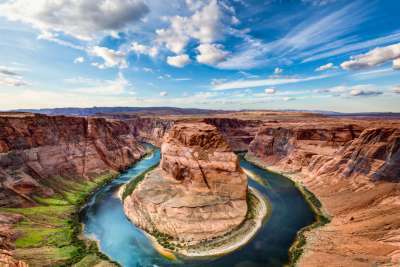 The sight is about as dramatic as Hamlet on an episode of Hollyoaks, and can be discovered by taking a four-hour car journey from Phoenix Airport. Or combine with a trip to nearby (well, on these scales) Las Vegas. Located in the Graian Alps, and taking its namesake from the highest mountain in Italy, Gran Paradiso is also Italy's largest and best-known national park. 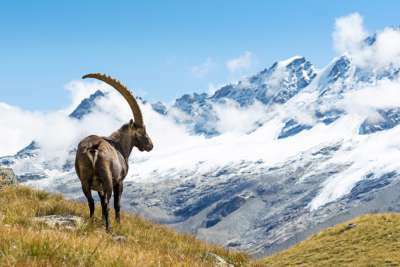 On a high-alpine pasture, you may find golden eagles swooping above the treeline, while horned ibexes, lynxes and wolves roam its wide valley meadows. The air is pure while the ice is squeaky-clean and the grass is green. Come here for an exceptional hike, just a two-hour train ride from Geneva Airport. This ginormous, biodiverse national park in Australia's Northern Territory showcases savanna woodlands, tidal mudflats and monsoon forests. It's home to the likes of crocodiles, flatback turtles and around 2,000 unique plant species, but it's also full of human history too. Aboriginal paintings, which date back to prehistoric times, can be found etched into the orange-brown rock faces. It's around a three-hour drive from Darwin Airport. 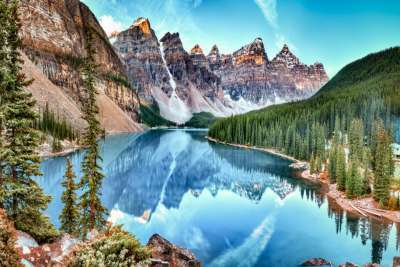 With something to fit every kind of temper; horseback trails for the gallant, lazy lakes for the well, lazy, and mountaintops full of moose for the daring - Banff national park is dizzyingly beautiful. The glassy lakes retain their colour thanks to the glacial rock flour, while the forests stay thick as the flowers explode through the ground in droves. You can see this Canadian wonderland yourself, by taking a three-hour drive from Calgary Airport. 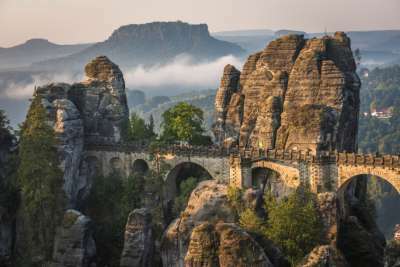 Since Saxon Switzerland encompasses such a large terrain, you'll find a great diversity of natural habits, which run up alongside one another in close proximity. Blankets of forests, mountains, moors and meadows all coexist and invite horned owls and black storks to roost. At the end of the horizon, you'll even see castles and fortresses, but the main event is the nature which surrounds them. Although this feels like a wilderness, the park is only 19 miles from Dresden Airport, and can be reached via a train which will take you to the local communities of Bad Schandau, Sebnitz, and Neustadt.